Blu-ray to HDD is powerful Blu-ray ripping software with the ability to convert Blu-ray movies to mkv or ts files. 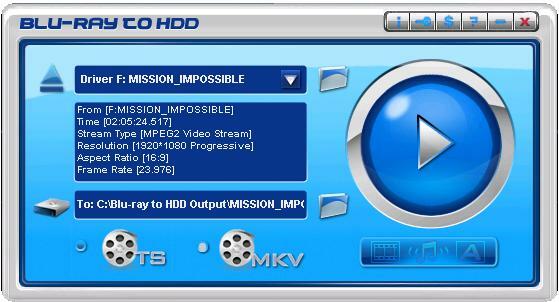 Now you can enjoy any Blu-ray movie on PC with a software player (like KMplayer, Mplayer and PowerDVD), or on TV with a HDD player (MVIX, TVIX). The built-in engine will ensure a perfect conversion of almost any popular Blu-ray movie. Its fast converting speed and user-friendly interface will make the converting process easy and fun. * Rips with high definition and highest rate. Qweas is providing links to Blu-ray to HDD V1.70 as a courtesy, and makes no representations regarding Blu-ray to HDD or any other applications or any information related thereto. Any questions, complaints or claims regarding this application Blu-ray to HDD V1.70 must be directed to the appropriate software vendor. You may click the publisher link of Blu-ray to HDD on the top of this page to get more details about the vendor.